"There is, however, in New England, an aristocracy, if you choose to call it so, which has a greater character of permanence. It has grown to be a caste—not in any odious sense—but, by the repetition of the same influences, generation after generation, it has acquired a distinct organization and physiognomy...." This series of articles collectively became the novel Elsie Venner, published in 1861. The object of Elsie Venner was, "an attempt to illustrate the doctrine of inherited moral responsibility for other people's misbehavior." In broad terms, this was an intentional contradiction of certain theological (Calvinist) beliefs such as pre-destination. An unintended consequence of describing a New England Caste of strict progeny, educational, religious, and business practices, was to later make the Brahmin families appear quite elitist. Many of the Brahmin families had descended from the original Puritan settlers of Massachusetts. Holmes was a descendent of Thomas Dudley, Governor of Massachusetts in 1634, 1640, 1645, and 1650. The most well known wealthy families of nineteenth century Boston include the Appletons, Bacons, Cabots, Codmans, Coolidges, Forbes, Hunnewells, Lodges, Parkmans, Perkins, Russells, and Shaws. Old guide books exist that trace the ancient lineage of these families, and some even trace the lineage of their Beacon Hill addresses! Brahma, in Hinduism, is the Supreme Entity of all Matter and Spirit alike. 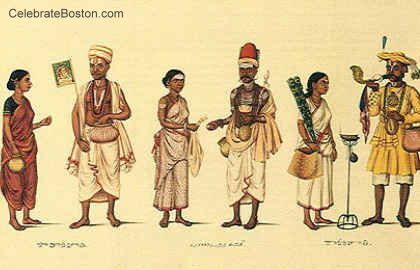 Traditional Hinduism contains five distinct castes or classes of people. A Brahman is a member of the highest, priestly caste. The other castes are, in decreasing status: Kshatriya (rulers/warriors), Vaishya (merchants), Shudra (artisans/servants), and Harijan (outside caste). People are born, married, and die in these castes. Mr. Holmes might have picked Kshatriya or Vaishya as the name for his New England Caste, if only for legacy reasons—some men in these families became eventually known as Merchant Princes in history. 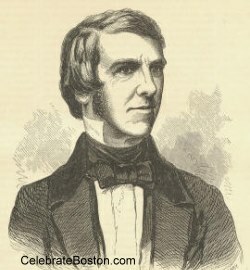 Holmes also coined the phrase Hub of the Solar System, which to this day is still a nickname for the city of Boston, although modernized to The Hub of the Universe or compressed to just The Hub.